We love Chewy.com and so when they asked if we'd like to try Old Mother Hubbards' dog treats, we quickly agreed. 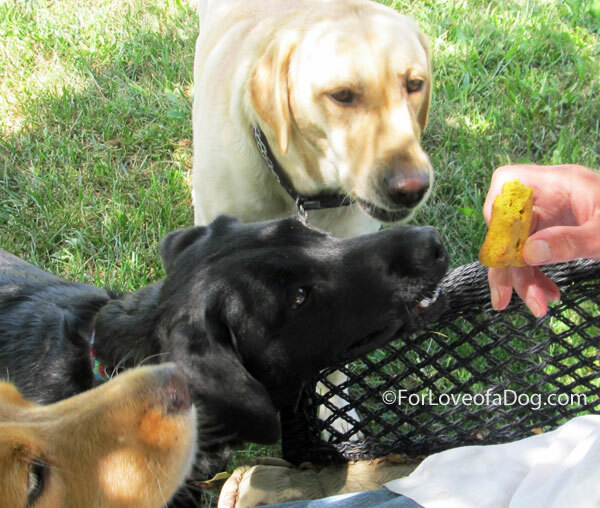 Jeffie, Rudy and Rosie are always up for a taste testing! 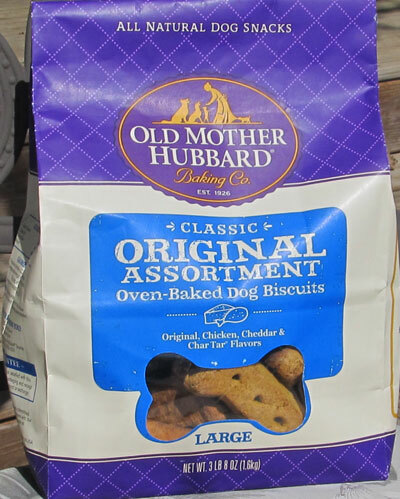 Old Mother Hubbard's classic recipe was originally developed over 80 years ago as a snack for fishermen while out at sea. 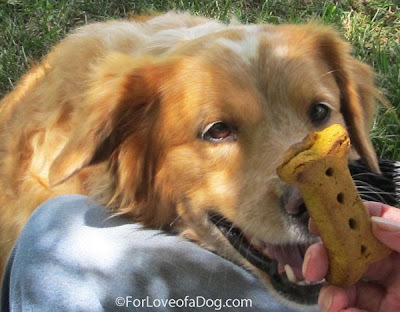 These days they bake a variety of dog treats from all-natural ingredients including: chicken, cheddar cheese, apples, carrots, sweet potatoes and oatmeal. 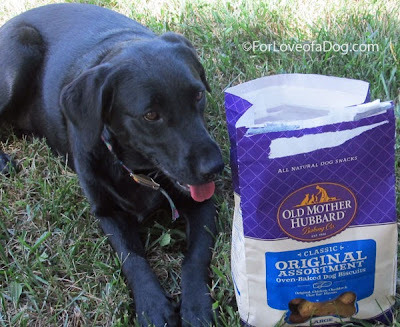 We received a 3.5 pound package of Old Mother Hubbard Classic Original Assortment Oven Baked Dog Biscuits to try. These bone shaped biscuits included Original, Chicken, Cheddar, and Char Tar flavors. 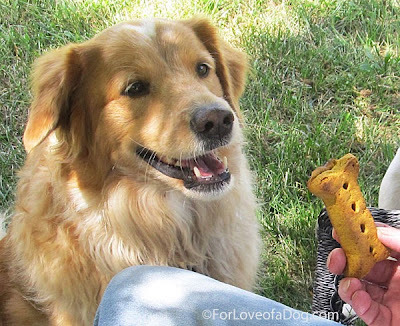 These come in several sizes of treats, from mini to large and in several package size options. We received a package for large dogs. Ingredients: whole wheat flour, oatmeal, wheat bran, chicken fat (preserved with Mixed Tocopherols, a natural source of Vitamin E), chicken, tumeric, charcoal, cane molasses, paprika, paprika extracts, white cheddar cheese, eggs, apples, carrots, garlic, salt. Note: Old Mother Hubbard does offer wheat-free dog crunchy dog treats: Chick'N'Apples. You'll notice that our taste testing took place outdoors. That's because of the caution listed on this bag of dog treats about staining. According to Old Mother Hubbard, all of their crunchy products that have tumeric in the ingredients carry a caution statement. Tumeric is a natural spice which is bright yellow in color (they use it to color some of their products naturally.) 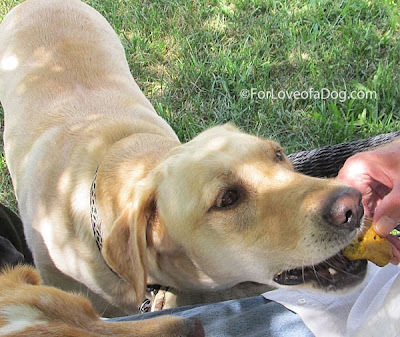 However, when combined with the saliva in the dog's mouth, it can sometimes create yellow staining. These are very large dog biscuits and when we opened the bag we were greeted with the smell of cereal and grain. 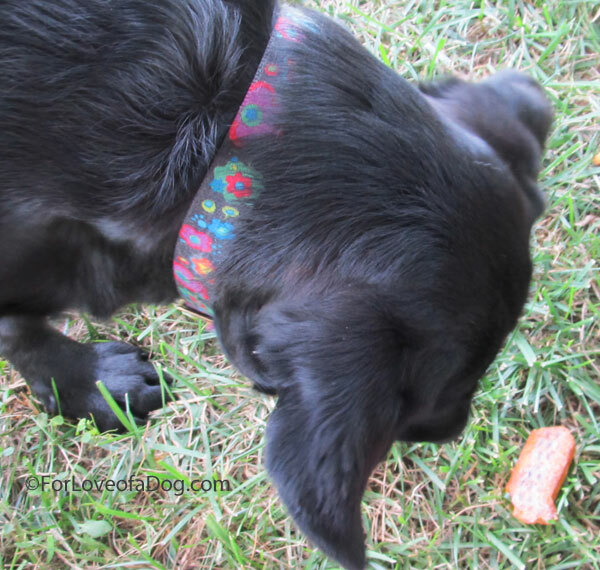 Not only were our dogs thrilled at the extra large size of these treats, they loved the taste. They each got to try two different flavors. Very crunchy, there was a lot of satisfied crunching going on. Then, of course, they had to check for chunks or crumbs in the grass. We like that these dog treats are made with human grade natural ingredients in the United States. They looked good, smelled good, and our dogs loved them. Our order from Chewy.com was filled and shipped to us super fast. Jeffie loves the bonus he receives with Chewy.com orders: another chance to protect us from the FedEx man. .Rosie is keeping an eye on the bag, hoping some more biscuits will jump out and into her jaws! 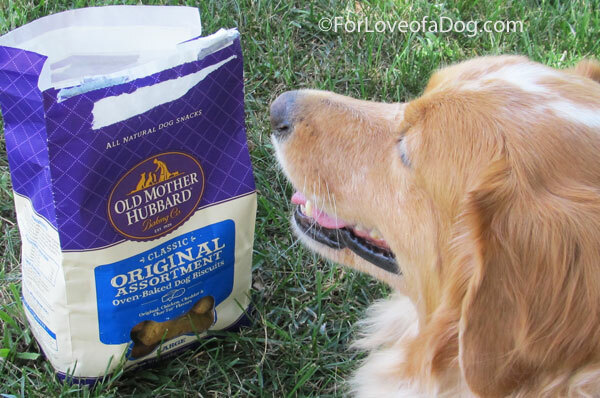 We're pleased to give Old Mother Hubbard Classic dog treats and Chewy.com all paws up for any dogs who are not sensitive to wheat, paprika or tumeric. 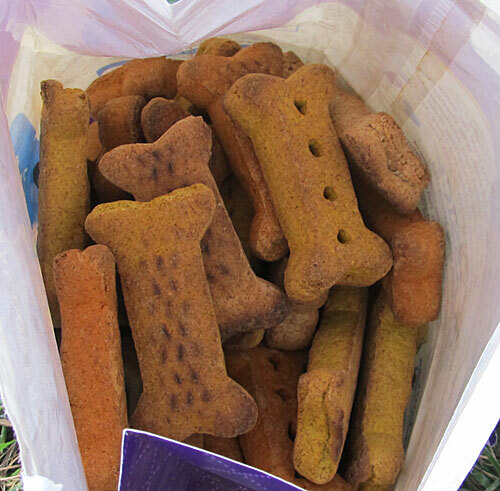 Note: we did notice any problem with the tumeric leaving any stains when the dogs each had one of these dog biscuits inside the house. 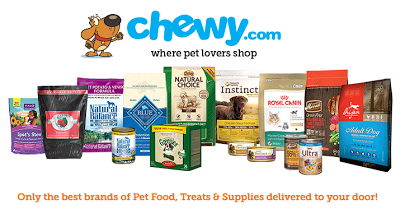 Plus, we received these dog treats from Chewy.com, a company we love for their superior customer service, super fast home delivery, easy to navigate website, and wide selection of pet food and supplies. * We received one bag of Old Mother Hubbard Classic dog biscuits from Chewy.com in exchange for our honest review of the product and service. We received no other compensation - financial or otherwise. The humans were offered those to try and they picked food for the cat if you can imagine that! Oh those look super tasty!